The closest place to Broome to get yourself beside a river is about 140 kilometres/ 87 miles along the Great Northern Highway towards Derby. The Fitzroy River is accessible from the main highway, but even better is to get yourself onto the old highway and out to Langi Crossing. The old gravel road is not marked, but is very wide and you can see a gate on your left as you follow the road as it sweeps off to your right. When you approach the gate it will still not say where it goes, but will warn you that the property has 1080 dog baits on it in an attempt to eradicate wild dogs. 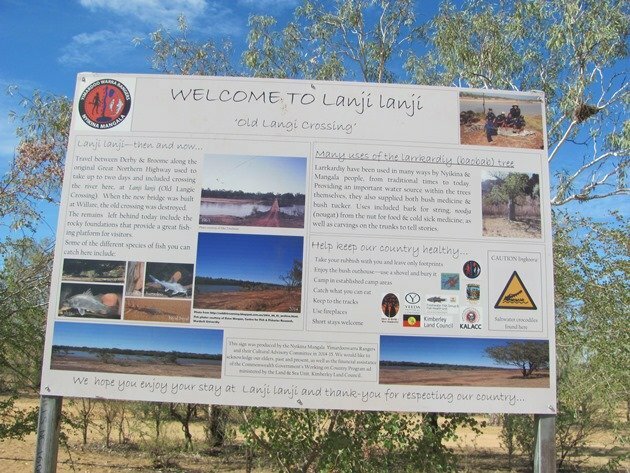 You follow this gravel road for about 10 kilometres/6 miles and you will come across another sign and that does tell you that you have almost made it to Langi Crossing! The road is corrugated, but many a boat on a trailer and caravan has made their way out there to chase a barramundi or to relax by the river! However, the gravel road is not easily accessible after rain, so be careful! 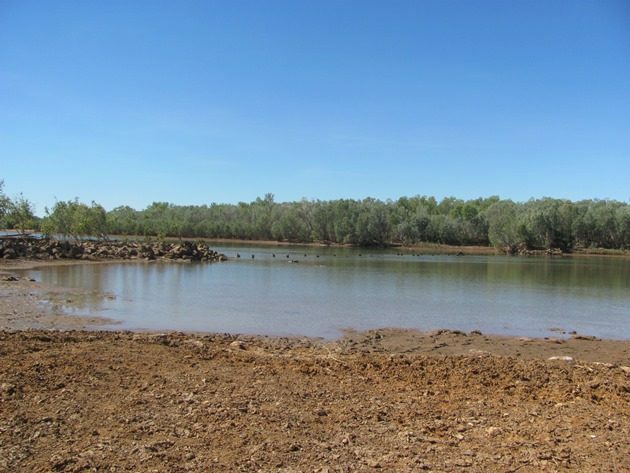 When you go through the second gate you turn to your right and you will soon be beside the almighty Fitzroy River. The header photo shows the posts that remain from the old highway when it crossed the Fitzroy Rover at Langi Crossing. 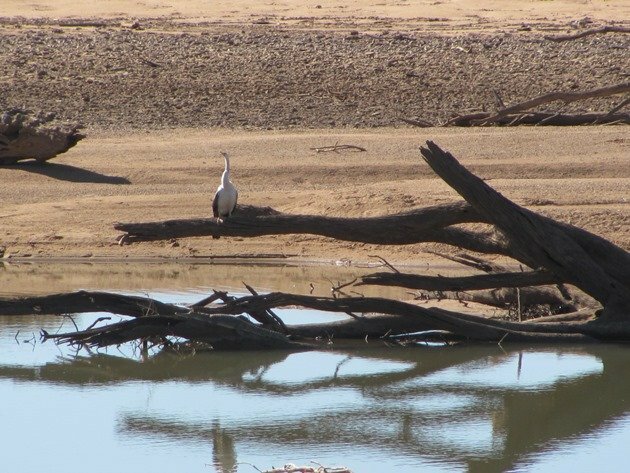 This is the Fitzroy River that runs through Fitzroy Crossing some 250 kilometres/155 miles further up the Great Northern Highway where we often stop at the Low Level Crossing to go birding. Geikie Gorge is also close to Fitzroy Crossing and it is also the Fitzroy River that flows through it. That area is great for looking at geological formations, crocodiles and birds and I have written about that area in the past. 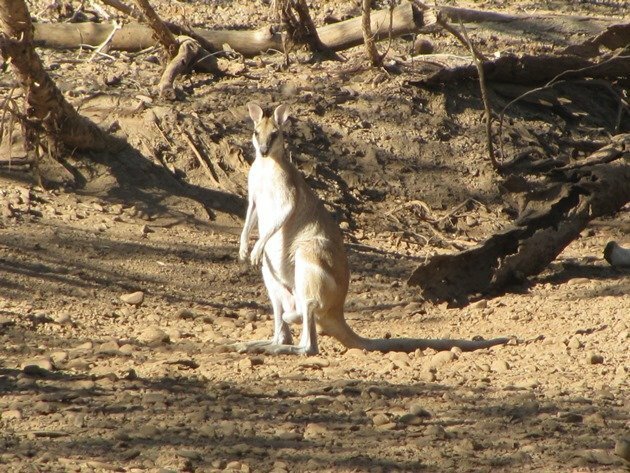 So, now I will tell you about this great place not too far from Broome with excellent opportunities to see crocodiles and birds! Camping in the bush at Langi Crossing offers great birding and in recent weeks we have observed over 80 species from a spot on the riverbank. Although we did do a fair bit of walking we discovered that when we looked back at our list that only one species was not seen from the camp we set up and that was the Red-capped Plover! 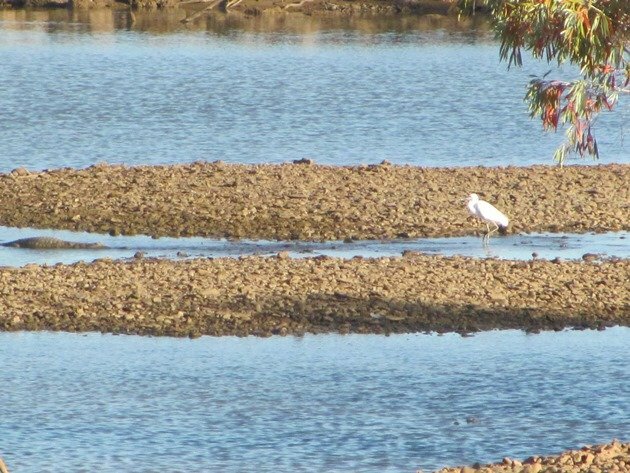 The area around Langi Crossing is tidal on very big tides and the high tide reaches the area approximately four and a half hours after Derby. 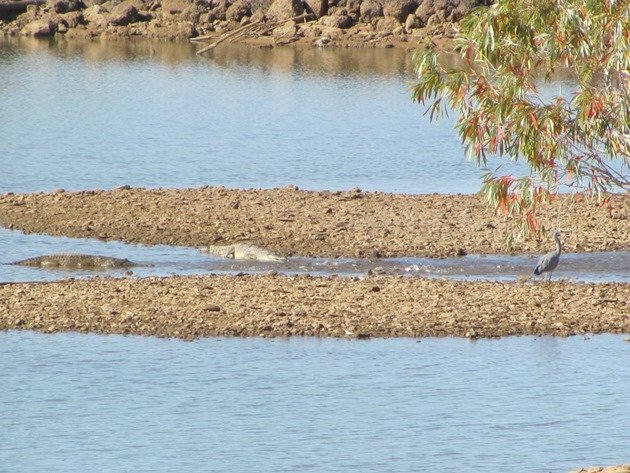 Once the tide reaches the fresh water of the Fitzroy River it is interesting to watch the fish move through the gaps in the rocks and the crocodiles and birds compete for the fish! This is a great place to observe crocodiles and there are both freshwater crocodiles and the larger saltwater crocodiles and both species are all along the river. During the day they are mostly on the river bank and prefer the soft sand on the far side to the rough rocks on the side where you can camp. They walk high on their legs to avoid scraping their bellies on the rocks and lounge around all day. At night the river is full of “eyes” if you shine your torch over the edge of the river bank. 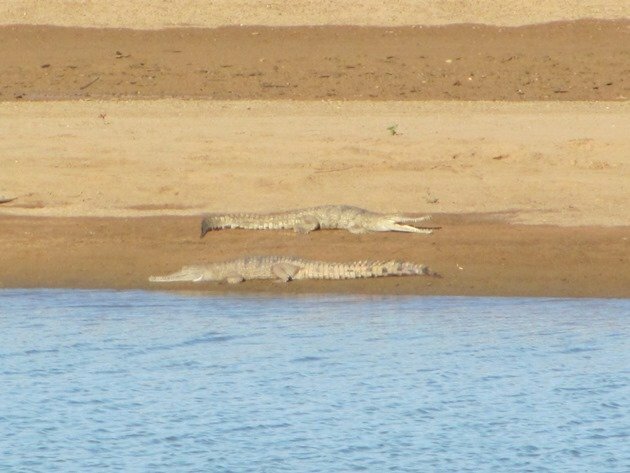 We counted over forty crocodiles from our camp by the river in the middle of the day when they were all soaking up the sun! 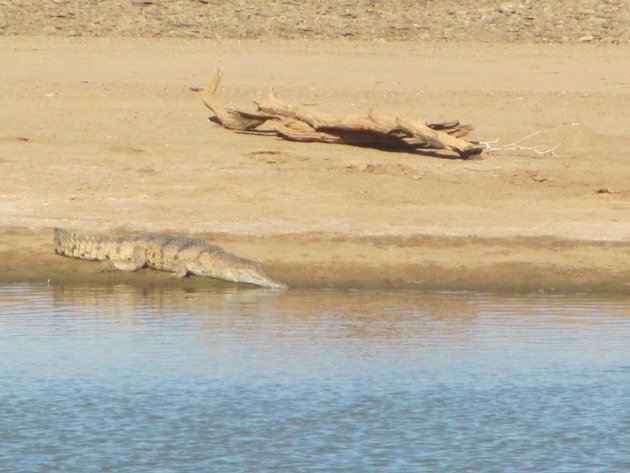 Lazy afternoon for a crocodile! Some logs are not logs! 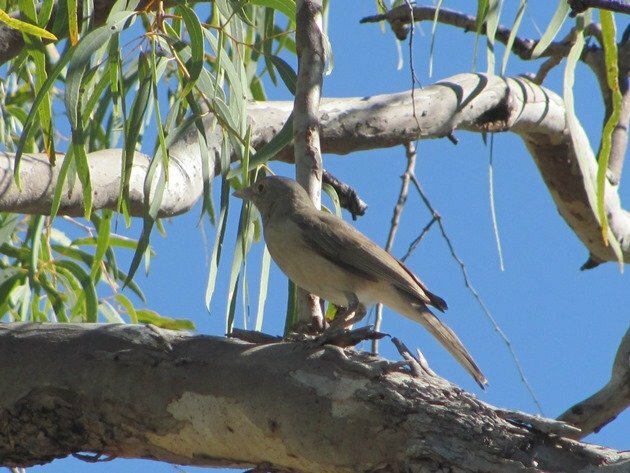 While sitting quietly one day I heard a scuffle and turned to find our friendly Grey Shrike-thrush had taken on a rather big meal that had successfully escaped! 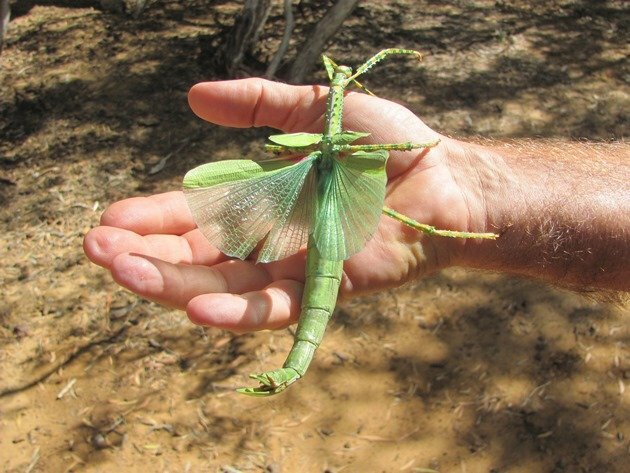 The Giant Phasmid was on the ground displaying its red wings and I took several photos of Grant holding it so that you can appreciate the size of this magnificent creature! 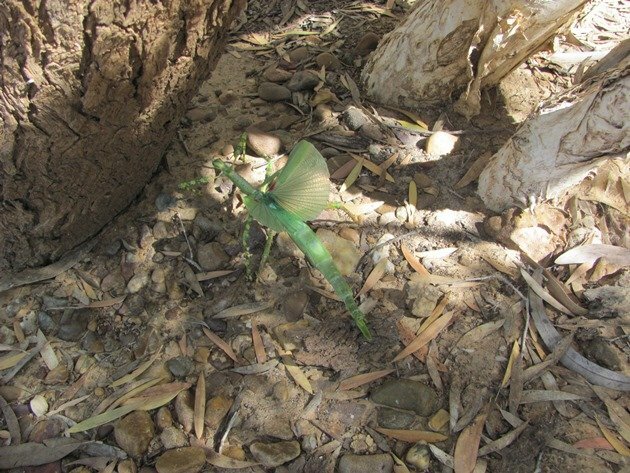 We have had them in the garden at home in Broome, but as was the case on this occasion you just don’t see them unless there is an “incident”! Evenings are not quiet by the river, because you have the wailing of the Bush Stone-curlew and the two tone call of the Southern Boobook and the occasional Barking Owl! 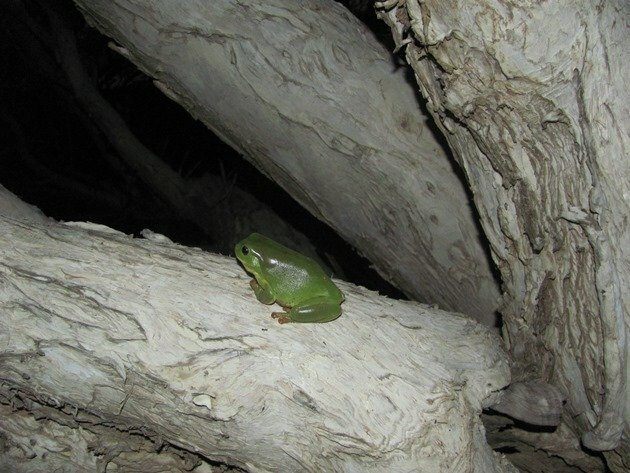 Add to that your resident camp Green Tree Frog and there is plenty going on! 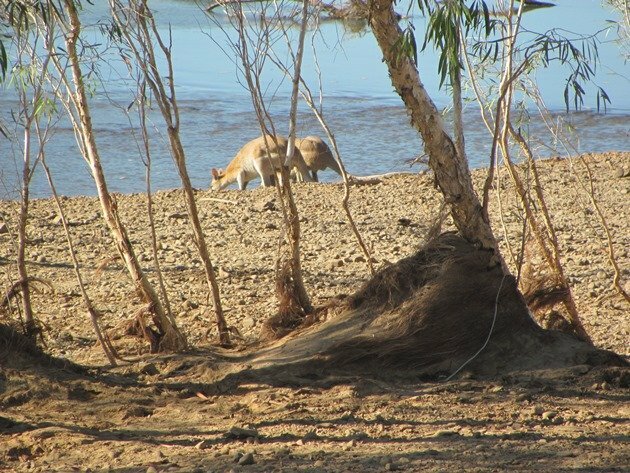 Early mornings bring the Agile Wallabies to the river and they wander down the river bank to drink and then lay in the shade for a good part of the day. 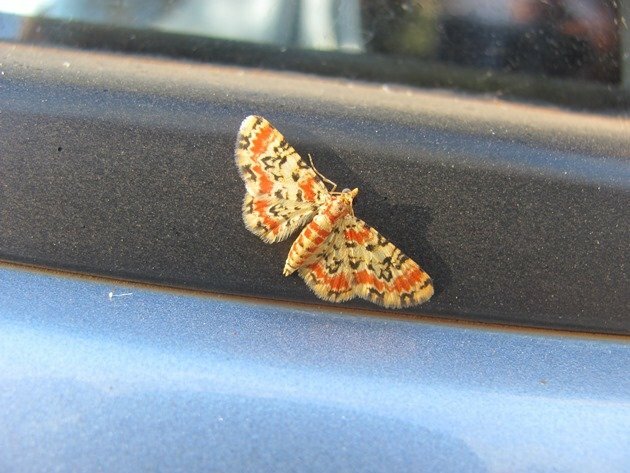 The insects are not particularly problematic by the Fitzroy River and can bring in some beautiful specimens as with the moth that moved onto our vehicle overnight. 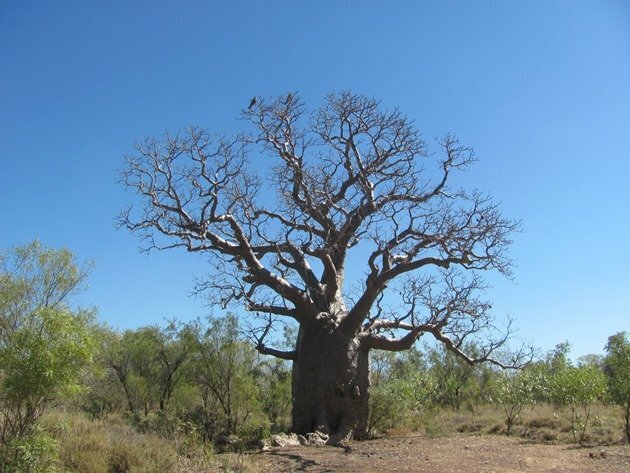 If trees are of interest to you then you have come into Boab tree country and at this time of year they have no leaves, so make for easy birding! Surprisingly there is phone reception with Australia’s main telecommunication provider at this location despite it not being near a town! 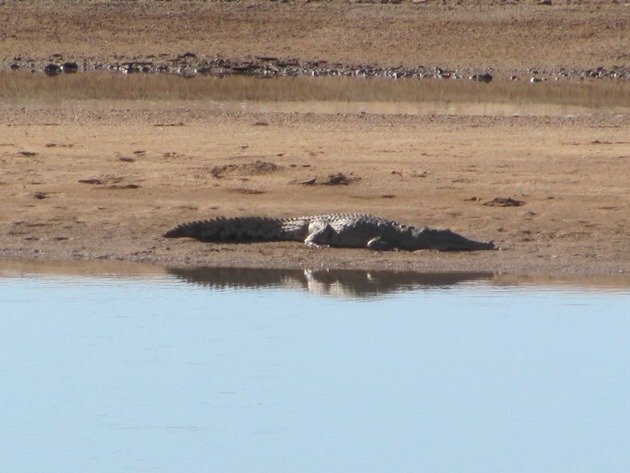 I will expand a lot more on the birding at Langi Crossing next week, but for now you have probably been convinced it is a good place to go to see crocodiles not too far from Broome! What an amazing assortment of animals! 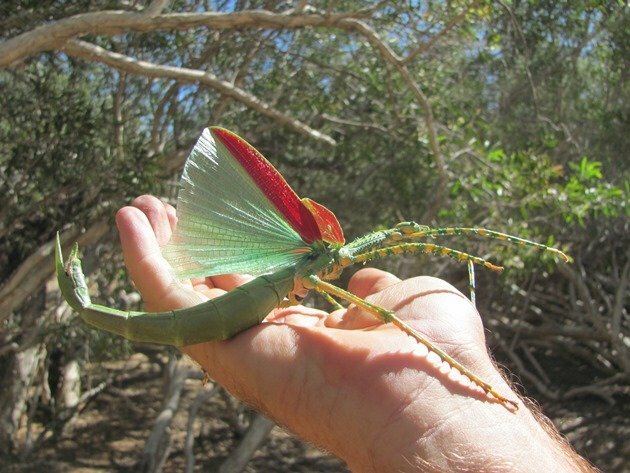 The birds are beautiful, but so are the frogs and insects, especially that Giant Phasmid! It looks like an incredible place to visit.